A Cambridge production of Hamlet delivers a dangerous message. Imogene Quy, nurse and fellow of St. Agatha’s College, is a curious, compassionate and clever sleuth. Her interest in the nightclimbers, daredevils who over the years have scaled most of Oxford and Cambridge’s historic buildings, is aroused when research fellow John Talentire falls to his death from Harding’s Folly. His father, Duncan, is being considered for a prestigious position, though his years as an expert witness have some scholars questioning his suitability. Imo has become involved with the Kyd players, forced to accept the wealthy student Martin Mottle’s offer of the large sum they need to fend off a lawsuit if he can play the lead in Hamlet. 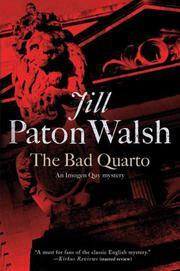 The producer chooses the Bad Quarto, a shortened text, hoping to avert disaster. The play turns out both better and worse than expected when Martin, a more accomplished actor than his rehearsals indicated, uses the dumb show to accuse an English fellow of murdering John Talentire, claiming that he would never have neglected to tie a safe knot in the climbing rope he was using. When Duncan says he knows who murdered his son but does not want the matter pursued, the college explodes in rumors. Imo (Debts of Dishonor, 2006, etc.) quietly goes about her own business while unearthing clues. Shades of Gaudy Night—a must for fans of the classic English mystery.